Every day is "Take Your Dog to Work Day" for farmers and ranchers! This is Ash from AlAnn Ranch. Pet Sitters International is celebrating their 12th Annual “Take Your Dog to Work Day” this Friday, June 25th. It made me chuckle at first. Why? Well, on the farm and ranch, our loyal dogs are with us daily at work. In fact, herd dogs on ranches are some of the hardest working dogs you’ll encounter. Up at dawn eagerly awaiting with wagging tail to follow your signal as the day begins on the ranch. If they can help it, they don’t miss a day. In fact, farm and ranch dogs have perfect attendance. 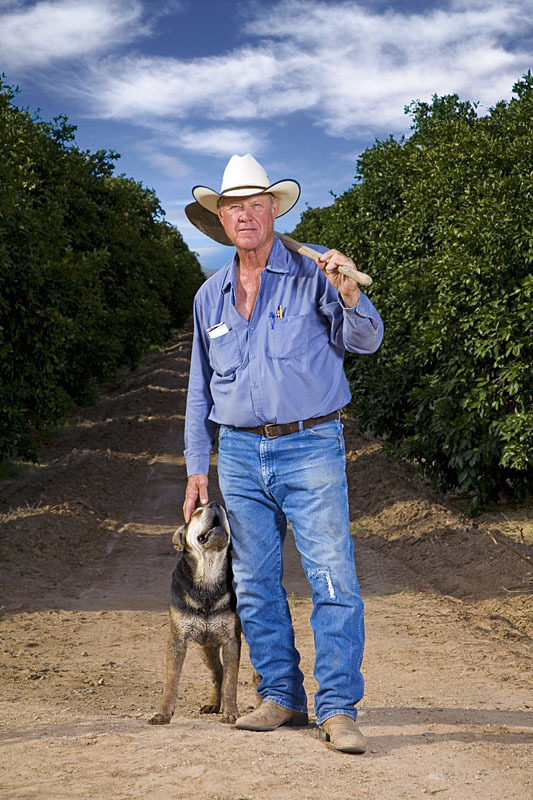 Our own dog stories while growing up on the Murphree Farm in Pinal County are full of joy and heartache. Our farm dogs were our best friends and even taught us about life and death. So, I thought Arizona farmers and ranchers (and former farmers and ranchers) should tell their stories about their dogs. Here are a few. 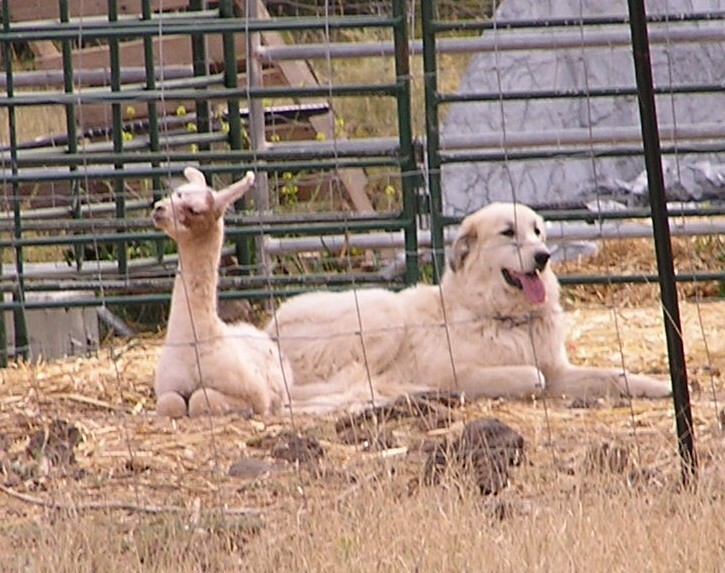 My dog, Ash, is a 5-year-old Great Pyrenees (GP)/Anatolian livestock guardian. She sleeps all day, and at night keeps the coyotes, owls, mountain lions and bobcats at bay with her puppy friend, Major. Major is a pure breed GP, but too young to know the ropes yet. That’s part of Ash’s job too, to teach Major. Ash loves her alpacas, and has even gone so far as to lick a new (llama) newborn baby clean and keep her company when she sleeps. Our barn cats love Ash too! Ash is warm and soft and makes a good bed on a cold day. Ash even eats hay, mineral and pellets with the alpacas, though I make sure she gets a good quality dog food — whether she eats it or not! Wags was worth more than a man’s day wages and he showed up to work every day. A Border Collie/Australian Shepherd, he worked hard every day learning the trade through instinct and hand signals. One of the oddest parts of my dad, Buck, and Wags relationship is they never spoke to each other, they were both the strong silent type. We were all scheduled to meet up at the spring at the bottom of the canyon and hold up the cows before moving them on to their new country. When Dad and I joined up with Jack, Dad mentioned that there were still some cows in the canyon that were missed and then walked off toward a shady piece to pull his saddle and wait a bit. We followed suit. After about 15 minutes of resting in the coolness of a mesquite tree, we heard some cows coming through the brush. Sure enough, Wags was pushing the six cows into the tank lot at a nice, gentle pace. I realized then that Dad knew Wags was bringing the cattle and he was just waiting on his best help. Farmer DeWayne Justice and his dog. By Dru D. Alberti, AIS, CIC, AFIS, Sr. Ag Field Specialist, AgMax®, FBL Financial Group, Inc.
For some reason, our Minnesota cropland seemed to grow rocks. Lots and lots of rocks. So, each spring we’d be out in the field, an empty hay wagon rolling along behind the tractor. The entire family would walk the field, picking up rocks, and tossing (or lugging them) to the wagon. One day, our Border Collie, Robyn, came running up to us, holding something in her mouth. She got nearer the hay wagon and “plop!” She put the stone in her mouth on the hay wagon. When I said the whole family helped clear rocks that meant the dog, too. Typical of the mid-west, we used tiling to drain the fields, with culverts running under roads and driveways. Robyn was great at helping clear out the culverts, dragging sticks and branches out. Occasionally, she’d snag a root ─ still connected to a tree ─ with her teeth, and then there would be a struggle. She always managed to break off the offending limb, and toss it on the bank, out of reach of the spring run-off. She moved with us to Arizona back in 1998, and retired to be a back-porch dog. She was with us for 14 years, and even now, years later, I find myself calling our dog, Cinch (yes, another Border Collie) by her name. Robyn won’t be with me at work on Friday, but she’s with my whole family in spirit, every day. My grandparents’ blue-heeler, Pud the Second, was incredibly bored when they retired from ranching several years ago. Un-neutered and bored is not a great combination for a working cow dog, and he used to try to visit town to find a girlfriend. My grandmother, Dixie Jones, kept him shut in the front yard in Payson, and was dismayed one day to look out and find him gone. Likely cussing the dog, she hopped in the pickup and headed to town. She only made it down to the corrals before she spied the truant. The neighboring ranchers were using the Jones’ corrals to load some bulls, and there was Pud, loading them one at a time. All the cowboys were up on the fence. Grandma apologized for Pud getting in their way and asked if she could get him back. Not so fast. They asked her if they might keep him until all the bulls were loaded. One had gotten on the fight, hence their fence-top perches, when Pud showed up and put the bull in his place and in the trailer. She sat back and watched until Pud was done, turned down an offer for the dog, and then she and Pud returned to the front yard. I guess once a cow dog, always a cow dog. Dogs are invaluable on farms. I grew up with terriers and black Labradors. They were your home security system. They were the first to greet you before sunrise to feed the livestock. They followed me and my brother’s bikes to the corner every school day morning and were there mid-afternoon when we got back home to do chores. They helped heard the cattle in from pasture every evening. They were the first to hear the auto accident that occurred on a remote rural road and woke us up to get the victims help. And they were the farm’s rodent control. In the old days corn was picked with the corn on the cob-picker/shellers were not yet invented. A shelling crew would come in and back up to the corn crib and shell the kernels off the cob. There were mice and rats in the corn and as the crib emptied of its corn, those rodents had less and less cover. At a point, they would scatter and the dogs would do their job hitting one rodent after another. Yes, fond memories of Sparky, Blacky, Lady and Pepsi at work every day on that little family farm in eastern Nebraska. Now I have two Shih-Tzus who sleep on the bed and I get them up every morning. But in their own way they remind of those farm dogs of long ago. This entry was posted in Animals, Arizona farmers and ranchers and tagged animals, Arizona farmers, beef production, dogs, farmer, farmers, ranchers, take your dog to work day. Bookmark the permalink. I technically don’t live on a farm but I grew up with them all around and even now in Colorado we live on 2 acres with farms and dairy all around. Our dogs have always been a big part of the family. I also chuckled about taking your dog to work. In Our small down you will see mostly trucks and almost all have a dog or two in the back. These loyal animals are accepted every where. At times I worry about their safety as they run from side to side in the moving trucks. They wait patiently in the back of the truck in the parking lots of Walmart, Home Depot and Murdochs. The dogs are better behaved then most of the children and teens! We get the pleasure of watching the sheep herded down the mountain each year. It amazes us that two small dogs can manage hundreds of sheep and their babies. These little guys are as fast as lightning and with a small whistle jump into action. Last summer they didn’t hesitate to take on a pitbull that cross over into the pasture. We assumed our city Rottweiler would like to ride in the back of the truck but we were wrong. She prefers the cab. We love our dogs and could never imagine life with out one. It is a sad day when they get to old and we have to do the kind thing for them. I wish they lived longer. The best dogs are the mixed breeds and the ones we adopt from the shelters.